When Elon Musk’s owned SpaceX company needs a break from Newyork-Washington DC Hyperloop project, they organize the cool SpaceX hyperloop competition for young engineers to show young talent to the world. In the recent 2018 Hyperloop Pod Competition, WARR hyperloop has yet again grabbed the first position leaving every other team eating their dust (literally!). The engineering students from the Technical University of Munich, Germany. 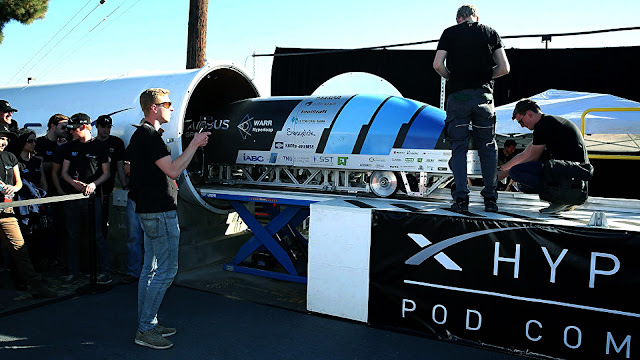 managed to pull out record-breaking 290 mph (466 kph) with their self-propelled hyperloop pod. And surprisingly, the new speed record has broken the previous record of 200 mph which was grabbed by…..WARR hyperloop itself. Not only that, WARR even broke the record set by Virgin Hyperloop, in December, of 240 mph. Meanwhile, Virgin is busy with their Hyperloop projects in North America, Asia, and Europe. The competition is gradually becoming insanely tricky each year. Last time, teams were allowed to accelerate their pod with SpaceX “pusher.” This year, all the pods had to be self-propelled. WARR Hyperloop was one of 20 teams that took part in the competition. And pods were sent to a 0.8 mile (1.5km) ground level test at the SpaceX headquarters in Hawthorne, California. While WARR grabbed the first position, Delft University from the Netherlands and EPFLoop of Switzerland came second and third, respectively. Elon Musk first described his idea for a futuristic transportation system at speeds of hundreds of miles an hour back in 2013. Following which, many different companies came out with their own hyperloop projects to build a new future.